After many years of being tipped for great success without ever reaching it, DR Congo went into the last Cup of Nations as underdogs, only to surprise everyone by progressing through to the semi-finals. Bizarrely, they did it by only winning one match; they drew all three in their group, before emerging from their shell to batter their Congolese rivals 4-2, and suddenly they were in the last four. This time, there’s a lot more expectation. Their qualification campaign was very impressive. Despite an early defeat in the Central African Republic, they won five out of six, and ended their campaign with 10 goals in two games: a 6-1 win in Madagascar, followed by a 4-1 home win over CAR to clinch their place in Gabon. Only Algeria, who had perhaps the easiest group out of all the big teams, scored more goals in the group stage. They have also started their World Cup qualifying campaign in the same manner, battering Libya 4-0 before an impressive 2-1 win in Guinea. However, the Leopards have recently been rocked by the news that star player Yannick Bolasie of Everton will miss the tournament with a knee injury. But while their biggest name won’t be there, they are not short of quality in attack and may not even miss him in the end. They are blessed with effective out-and-out strikers like Dieumerci Mbokani and Cedric Bakambu, but can also call upon less well-known firepower from the wings like Paul-Jose M’Poku, Neeskens Kebano, Jordan Botaka, Ndombe Mubele and Jonathan Bolingi. If anything, the big question mark here is still the defence. It’s hard to gauge exactly what form the main line-up of the team will take as Ibenge rotates a lot. After all, he can afford to. With Bolasie, the one constant in the attack, out of the picture, it makes it even harder to see who they will play through. But what we do know is that Ley Matampi is now the first-choice keeper, taking over from the great man Robert Kidiaba. Goalkeeper Ley Matampi, Gabriel Zakuani, Issama Mpeko, Marcel Tisserand and Joyce Lomalisa will probably make up up the defence, while Mbemba has played well in central midfield. The rest? Anyone’s guess, but whoever is playing will look to break quickly. Potent attack – DR Congo’s rapid attack should make them one of the most potent forces in Gabon. They have an embarrassment of riches to choose from, to the point that they may not be able to accommodate some of their better-known players. They are seemingly the only team here that could sustain the loss of a key player like Yannick Bolasie, who has been one of their few constants. Expect them to rotate through the tournament more than would be expected, which will give them plenty of quick options off the bench and could make them a big factor later in games. 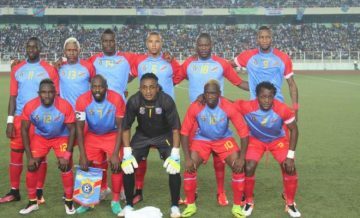 The defence – Inevitably, if you have an attacking team, gaps will appear at the back, and this seems to be the case for DR Congo. They kept just one clean sheet in qualifying, though in all bar one of their matches, the goals came in the second half. In Gabriel Zakuani and Marcel Tisserand, they have a centre-back pairing that is less heralded than their attackers and one which has needed protection from the midfield; Ibenge has taken to playing defenders there too, including Chancel Mbemba who is now a fixture there. Sitting deep helps mask this weakness in their squad. Dieumerci Mbokani – With Bolasie gone, it’s hard to nail down who the side will now be built around, as everyone rotated around him in qualifiers. Mbokani seems to have the striker role nailed down, having briefly withdrawn from international duty after the Brussels bombings, and scored two of the four goals against Libya. Jonathan Bolingi – Currently playing at home for TP Mazembe, 22-year-old Bolingi is one of several youngsters competing for spots on the flanks in this counter-attacking team. He was a breakout star in qualifying, scoring against Angola and CAR, and looking the part as an international footballer. Florent Ibenge – Still jointly managing DR Congo and Vita Club, Ibenge has now been in charge for over two years and oversaw the Leopards’ run to third place two years ago. Also masterminded Vita Club’s run to the final of the CAF Champions League in 2014, which they lost on away goals. The Leopards are a bit of a wildcard in Group C. DR Congo has just 1 streak of 3 consecutive victories in their past 43 matches. Despite the inconsistency, you can expect them to score in bunches. Over their past 16 matches, DR Congo has averaged just shy of 2 goals scored per match. In fact, over the past two years, only Senegal has won more games in Africa than DR Congo. This is the Group of Death. This group contains three teams which all are worthy of reaching the AFCON finals: the last edition’s champions (Ivory Coast), a last edition semi-finalist (DR Congo), and a team which could easily have been in the mix to be AFCON champions had they been in a different group (Morocco). While DR Congo’s odds of advancing out of the group are a paltry 46.2% with an average of 3.39 points, they rank among the top 8 in overall odds to be crowned champions. DR Congo has about a 1 in 18 chance, or 5.60%, of finally returning to the winner’s circle as they did in the early 1970s. Quarter-finalists – This time I think they genuinely do deserve the mantle of dark horse contenders. If they avoid Ghana, I’d expect them to make the last four. However, that seems unlikely, so quarter-finals seems more likely.